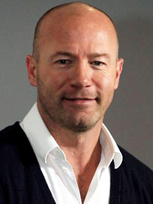 Alan is a former England football captain, world's most expensive player, and current TV pundit. lan Shearer is one of the most feared and respected strikers of the modern era and a wonderful ambassador for the game. His debut was an indication of the wealth of talent Alan has when he scored a hat trick for Southampton against Arsenal on 9th April 1988 (4-2 victory) and went on to became the only player in English football history to score 30 or more goals in three consecutive seasons. On 6th August 1996, after Alan’s successful Euro 96, where he finished the tournament’s top goal scorer, Alan joined his beloved Newcastle for a world record fee of £15.6 million, fulfilling his childhood dream to play for his local side. Alan is one of the most feared and respected strikers of the modern era and a wonderful ambassador for the game. His debut was an indication of the wealth of his talent – he scored a hat-trick for Southampton against Arsenal on 9 April 1988 (sealing a 4-2 victory). In 1992, at the start of the Premiership, Alan moved to Blackburn Rovers for a British record fee of £3.6 million, forming a lethal partnership with Chris Sutton, which became known as the SAS. Blackburn won the FA Premier League in the 1994/1995 season, with Alan contributing 34 league goals at the beginning of a sequence in which he became the only player in English football history to score 30 or more goals in three consecutive seasons. As a Newcastle player, Alan helped secure the side's position as one of the world's premier clubs. English PFA Player of the Year in 1995 and 1997, he scored 30 goals in 63 games for England, before his retirement from international football after Euro 2000. On 7 January 2006 Alan equalled Jackie Milburn's 50-year record of 200 goals and finally on 11 May 2006, Alan bade an emotional farewell to Newcastle United in front of 52,000 fans. 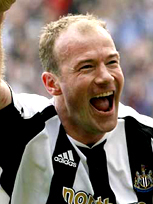 Alan Shearer was a goal-scoring machine. In a total of 701 club games he scored 379 goals. He is still the English Premier League's all-time highest goal scorer and was the first player to 100 and 200 goals in the League. Alan was awarded the OBE in 2001 and is a football pundit with the BBC.